Time Travel and Causation in the Climate Debate | Wott's Up With That? “Time Travel and Causation in the Climate Debate“ (May 16, 2011). Anthony Watts posts Craig Loehle’s petty irritation with the IPCC. In the climate change debate, by contrast to physics, the force of GHGs and human evil is so great that it transcends time. Bad things happen BEFORE their cause. It is simply amazing. He’s annoyed with the IPCC AR4 Report’s attribution chapter, in a general sort of way. Why doesn’t it restrict itself to the post-1950 era when man-made greenhouse gases (maybe) started to (maybe) influence climate? 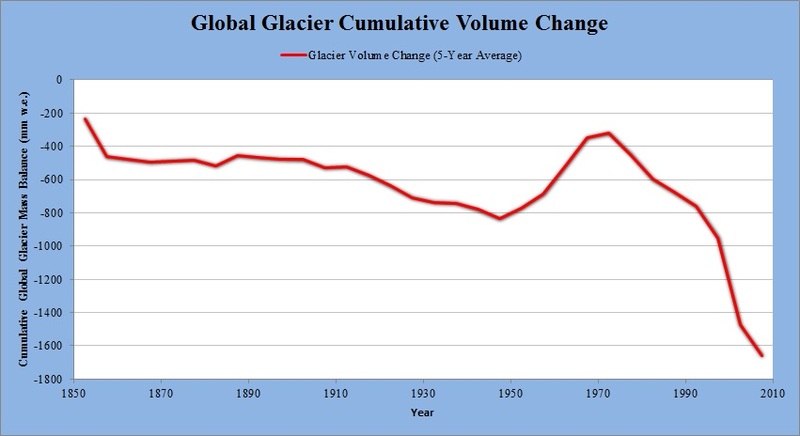 How dare they talk about glaciers in the 1850’s (um, see Skeptical Science), or that “impacts claimed by the IPCC to be likely in the distant future are claimed to be already evident.” After-all, changes predicted by the distant future must only happen in the distant future. All at once (or were they supposed to be a perfectly linear transition over time? I can never keep the story straight). See, everything's fine! From Skeptical Science. I guess he’s simply too worked-up to bother providing references or quotations for the IPCC’s implied scientific transgressions. It would help though. Craig’s main peeve is that “Climate change will cause bad things, and climate change is happening. Therefore, if bad things happen it is due to climate change” is circular reasoning. Those lazy alarmists! QED, if that’s the way you choose to tell it. Strangely he has no problem with the denialist corollary that all climate change is natural, except in retrospect (Oops, too late). This entry was posted in I Can't Hear You!, It's Happened Before and tagged Sweeping Statements by Ben. Bookmark the permalink. He obviously thinks time travel is possible, and as such is fairly well disconnected from the basic physical laws. This is one of the reasons to read the blog as being scifi, but the writing style isn’t to my liking so I very rarely visit this SciFi blog.